Posters featuring former Defense Minister and current Presidential candidate Abdel Fattah El Sisi and both Coptic Pope Tawadros II and Sheikh Ahmad El Tayyeb of Al Azhar are not uncommon in Egypt, offered both in praise and in condemnation. In praise, they attempt to burnish the legitimacy of Sisi as a man uniting all of Egypt and bridging the religious divide. In condemnation, they insist that the removal of President Morsi was a conspiracy between these unsavory actors. 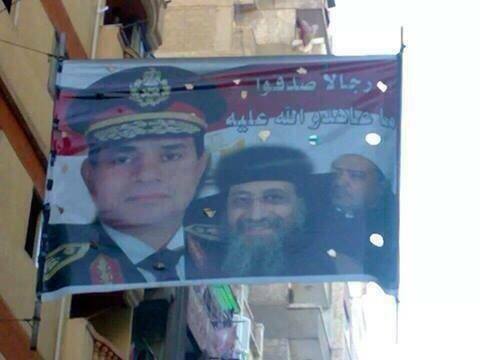 Such is the current polarization of Egypt that the same image can play both ways. In the wake of the removal of Morsi and the massive crackdown on the Muslim Brotherhood, the role of religion in public life, always a combustible issue in modern Egyptian history, is very much at the front of the agenda of any leader. I have argued previously that should Sisi assume the office of President he will face an array of problems that require innovative and effective solutions. The choice is stark: continue the regime established by Nasser in 1954 and face failure or attempt to alter it, at least as a transitional figure. The role of religion is one area where an exception can be made. Sisi has already made it clear that he disapproves of the Muslim Brotherhood view of religion in public life and made uncompromising statements insisting that they have no place in the political arena as an organization. The Brotherhood sees the state as the handmaiden for promoting religion; the vision that Sisi outlined turned that on its head, seeing religion as a tool for promoting the state and national unity. As a result, Sisi will have few choices but to echo the policies adopted by Nasser toward the role of religion in public life, or even earlier policies dating back to the beginning of the 20th century. These policies cannot be described as “secular”, but rather as state control of the religious message. He recalled his childhood growing up cheek-to-jowl with a synagogue and listening to Church bells as reflecting the “true” Egypt, a country of pious and religious people of peaceable nature. In that myth religion is a static feature of life reflecting the character of the people and serving as a foundation for the state. These misty ideals must be translated into policy, which will likely mean closer embrace of established religious institutions, such as Al Azhar and the Coptic Orthodox Church, as well as a greater role for them in public life. On the eve of the 1952 coup Al Azhar was active in supporting King Farouk’s efforts to claim the title of “Caliph”. Nasser, having deposed Farouk, had no choice but to attempt a major alteration of Al Azhar. He placed it under effective state control and expanded its purely religious role to include a variety of university-level educational programs. After Nasser’s death Al Azhar continued to expand. Today some estimates claim that as much as 25% of secondary and 10% of post-secondary non-trade students attend Al Azhar schools, run independently from the Education ministry. If Sisi is to achieve his desired goal of creating an alternative to political Islam, he will have to pay close attention to the massive Al Azhar institution, perhaps assuming even greater control than Nasser attempted. Rather than make the public sphere less religious, the state will likely attempt a nationalistic channeling of the message. Sisi, in friendly gestures to Tawadros II, also seems to be well on the way to emulating Nasser’s close relationship with Pope Kyrillous VI. Kyrillous was invested in 1958 as a compromise transitional figure between the old guard of the Coptic Orthodox Church and the fiery young reformers, the group of well-educated monks from the Middle Classes, known as the “Sunday Schoolers”. The friendship they formed for the remainder of their lives (Kyrillous passed away a few months after Nasser) was important for both men. The Pope managed to ease the restrictions on the building of Churches, including a grand new Cathedral at Abbasyia, inaugurated in 1968 with Nasser as the guest of honor. Nasser burnished his image as a leader of all the people, including the significant Arab Christian minorities in the Levant, who repaid him with adulation. Ironically, that era also marked a serious weakening of the liberal Coptic elite and strengthening of the role of the Church as the sole spokesman for the community. The feuds between the clergy and laity from the 1930s to the 1950s were ended by the wisdom of Kyrillous as well as heavy hand of Nasser, who marginalized much of the pro-democracy liberal Coptic elite. The vision Sisi is propagating is fundamentally different from the Brotherhood’s vision of religion, making it difficult to see how any political reconciliation is possible. The upcoming state, should Sisi hold onto power, will not be less religious for the removal of the Brotherhood; just differently so and probably equally intolerant of religious dissent or attempts at fundamental religious reform. This is neither the secularism of the French variety nor a free market of religious ideas in the Anglo-Saxon model. It can best be described as “statist religion”. It remains an open question whether such a re-orientation will create a viable alternative to political Islam or whether it will alleviate Egypt’s century long struggle with the place of religion within the national identity. At the moment, however, a majority of Egyptians seem to be in tune with an American revivalist ditty: “Gimme that ol’ time religion, ‘tis good enough for me”.